EVE 2 series modules provide developers with easy to access Human Machine Interface (HMI) solutions based on the FT81x series of high resolution display controller IC devices with second generation Embedded Video Engine (EVE) technology. 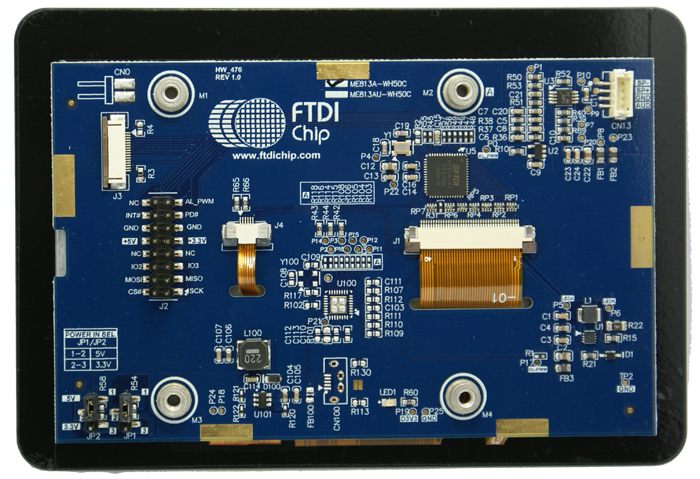 For EVE modules utilising the FT80x series of graphics controller ICs click here. The ME812A-WH50R is a development module for Bridgetek’s FT812, Embedded Video Engine (EVE) graphics controller IC. This module behaves as an SPI slave, and requires a SPI Master for proper micro-controller interface and system integration. The touch display controller includes a 5.0 inch 800*480 TFT display panel with resistive touch, and an audio amplifier to drive 8Ω speaker. The ME812A-WH50R module utilises the FT812 graphics controller IC. The graphic, audio and touch functions of the FT812 can be accessed with the ME812A-WH50R. To view the datasheet click here. The ME812AU-WH50R is a development module for Bridgetek’s FT812, Embedded Video Engine (EVE) graphics controller IC. 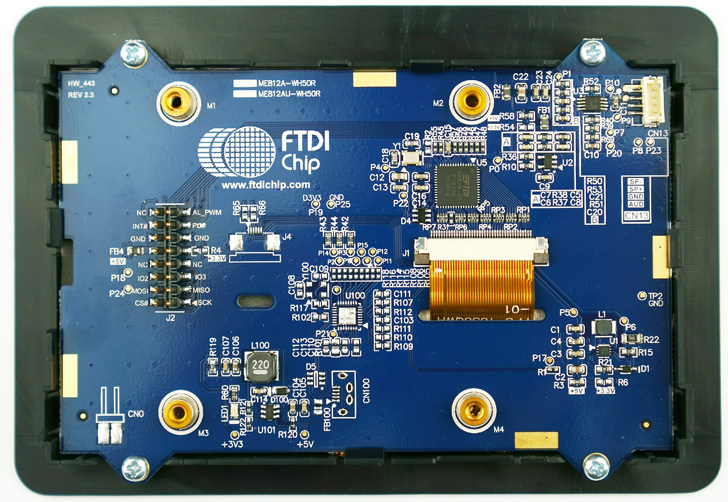 This module behaves as a USB device, with an FT4222H USB to SPI bridge built on-board so that the module can be accessed from a PC or any other USB host. The ME812AU-WH50R module includes a 5.0 inch 800*480 TFT LCD panel with resistive touch screen, and an audio amplifier to drive 8Ω speaker. 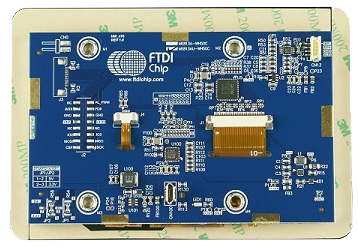 The ME813A-WH50C is a development module for Bridgetek’s FT813, Embedded Video Engine (EVE) graphics controller IC. This module behaves as an SPI slave, and requires a SPI Master for proper micro-controller interface and system integration. The LCD controller includes a 5.0 inch 800*480 TFT panel with capacitive touch screen, and an audio amplifier to drive an 8Ω / 1W speaker. 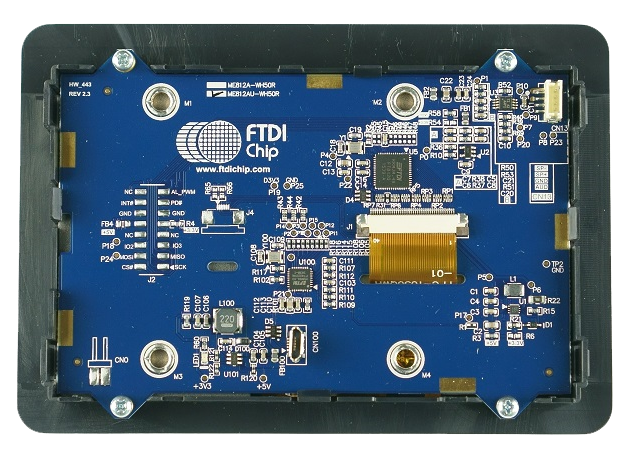 The ME813A-WH50C module utilises the FT813 graphics controller IC. The graphic, audio and touch functions of the FT813 can be accessed with the ME813A-WH50C. The ME813AU-WH50C is a development module for Bridgetek’s FT813, Embedded Video Engine (EVE) graphics controller IC. This module behaves as a USB device, with an FT4222H USB to SPI bridge built on-board so that the module can be accessed from a PC or any other USB host. The ME813AU-WH50C module includes a 5.0 inch 800*480 TFT LCD panel with capacitive touch screen, and an audio amplifier to drive an 8Ω/1W speaker. The VM810C50A is a development module designed for the FT810 IC, which may be used to develop and demonstrate the functionality of this resistive touch controller. The module behaves as an SPI slave, and requires an external SPI Master for proper microcontroller interfacing and system integration. The VM810C development systems are credit-card sized and support 5” TLCD controllers. Included on the module is a speaker for audio output and a 0.1” pitch connector socket for connecting to the SPI interface of the host system MCU. Power can be supplied via the SPI pin header, or a micro-USB connector, or a 2-pin DC input connector. The VM810C50A-D comes equipped with a 5” resistive touch display with 800 x 480 pixel resolution, while the VM810C50A-N is provided without the display to enable users to fit a compatible display of their choosing. Note that ME810A-HV35R-PL is now obsolete and is not recommended for new designs. If there is any demand, please send in your enquiry for special support consideration. For more information, please click here to contact us. The ME810A-HV35R includes the FT810 graphics controller IC and comes complete with a 3.5 inch 320x480 HVGA resolution display with resistive touch. The module is fully equipped with a black bezel, LCD backlight control, audio buzzer and an EVE IO connector to interface with the MM900EVxx modules or custom MCU boards over QSPI/SPI. 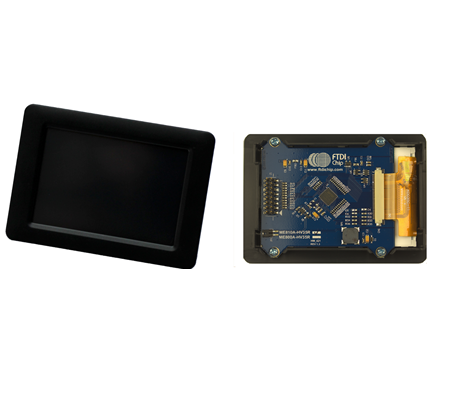 320 x 480 resolution 3.5 inch TFT LCD display with integrated resistive touch screen. Equipped with buzzer and LCD backlight control. Provides an EVE IO connector to interface with MM900EV or custom MCU boards over SPI/QSPI. Accessory - High Speed Micro USB to SPI Adapter for BASIC boards based on FT232H MPSSE design.